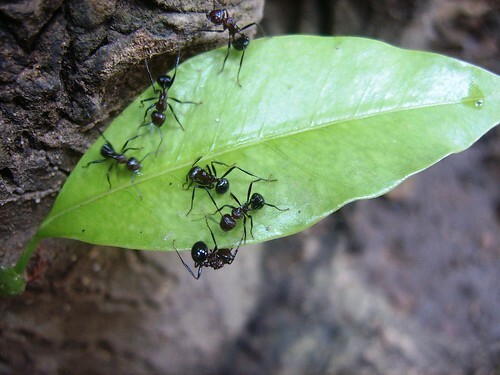 Ants on a leaf, a photo by Aarthi on Flickr. So, last week I was feeling pretty much like a slug. I was sore and tired and emotionally wrung out. I did have one little swim session but other than that, I laid low and didn’t do a whole lot other than sit around with fake frozen peas on my foot. This week I was feeling better! and ready to rejoin the world. It reminded me of times that I’d traveled to other countries for long trips. Re-entering my own country was often a disorienting and shaky experience. I’ve been off in triathlon country since July and coming back has been strange. But this week I went back to work. I was feeling pretty good. I was excited to be back in the world again, using my brain and my body. I think maybe I was moving a little quickly because when I was calibrating my big machine, I dropped a 15 pound steel weight -yeah – on my LEFT FOOT. The bad one! The one I’ve been icing all week! This time I dropped it right square on TOP of my foot. My other injuries are on the sides (ankles). It’s a good thing my foot has so many different surfaces to injure. Ay. Yesterday I could barely even wear a shoe. Today it’s doing a little better. But I’m getting impatient, because after a week+ of really no working out to speak of, I am READY. I need to do something! Argh! This weekend I’m going to join my new team (Hike/Snowshoe) for a nice long hike. I pray I can keep my feet intact until then. The forecast calls for rain but I don’t care. This is what I love about Team in Training -it’s that commitment, and we go out and “do the damn thing” regardless of weather or what. I’m ready to roll! ouchies!! feel better and be careful! maybe you can work out using just above your waist.